StriveTogether is proud to announce the designation of Graduate Tacoma in Tacoma, Washington, as our fifth proof point community. Reaching proof point recognizes that outcomes in the community are improving because of transformed systems and is a major milestone on the path to better and more equitable opportunities and results for every child, cradle to career. In 2010, just over half of Tacoma students were graduating high school, prompting USA Today to label Tacoma schools as “dropout factories.” Collaborative effort in the community has turned this headline on its head. Today, more than 240 community partners own a clear and common goal for students in Tacoma. For the last seven years, Tacoma Public Schools (TPS) has seen an increase in high school graduation rates, currently at 86.1 percent. This improvement, though, is just the beginning. Organizations, institutions and community members in Tacoma have aligned their work to support the cradle-to-career vision. TPS has set measurable graduation goals that align with communitywide goals facilitated by the Graduate Tacoma partnership. The city also has integrated these goals into its own strategic plan, with high school graduation as a strategic priority, demonstrating the commitment to students across the community. “When people think about education improvement and engaging families, the first thought is usually the PTA. 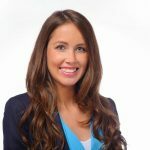 We have broadened our reach to include different community members,” said Amanda Scott-Thomas, director of the TPS Community Partnership Office. 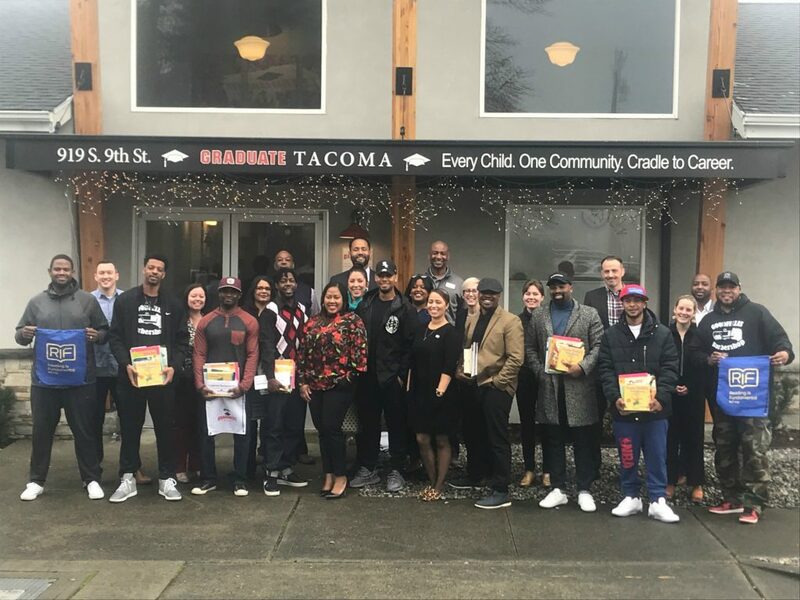 Thanks to the work of Graduate Tacoma, business owners and community members see and embrace their role in improving education for every child. This sense of ownership is seen daily, like in the Hilltop neighborhood, where barbers are sharing books with boys of color. The community doesn’t just look at data and “admire the problem” — they are aligning their actions toward shared goals. Graduate Tacoma and TPS have partnered to increase and improve data use. The organizations’ data-sharing agreement yields student-level information on achievement, attendance, testing and more, disaggregated by race/ethnicity and income level. Student-level data is used to target interventions to students on their path to high school graduation and beyond. Student-level data is used to target interventions to students on their path to high school graduation and beyond. As one example, Tacoma students now rank second in the state on applying for state-sponsored scholarships like Washington State Opportunity Scholarships (WSOS). And when the district noticed that certain types of students were disproportionately underrepresented in advanced placement courses, they created a policy to automatically enroll them. Now high school students who may have never thought of themselves as candidates for college credit-eligible classes are enrolled in these more rigorous courses, a policy shift that has doubled the number of students of color, students in poverty and the overall number of students taking these classes from just three years ago. The school district has developed a robust data infrastructure to ensure students are on track and supported to succeed. “A focus on current data, as opposed to just historical data, is helping teachers get the data they need to work with the students in their classrooms right now,” said S.J. Jacobson, data manager at TPS. Part of this infrastructure allows community partners to have access to students’ academic data to provide more targeted support for children in all areas of the community. Results indicate that partners are changing the way they work and moving at a faster pace because of their increased access to data. Graduate Tacoma’s Collaborative Action Networks (CANs) have grown, becoming more results oriented and data driven in addressing community challenges. CANs are engaging partner organizations strategically to create impactful practices. These groups consist of cross-sector practitioners and individuals who use a continuous improvement process to develop action plans to improve community-level outcomes. The Out-of-School and Summer Learning Network created a summer learning system that tracks participants across partners and enables them to identify and serve additional students. Over the last three years, partners have served an additional 5,840 students with expanded programming slots. The Early Learning and Reading Network has worked with TPS on preschool programming. Now, 30 of the 35 elementary schools have preschools on site. Graduate Tacoma has been designated as proof point in recognition of its work to rally the Tacoma community around data-driven results. The work doesn’t end there, however. 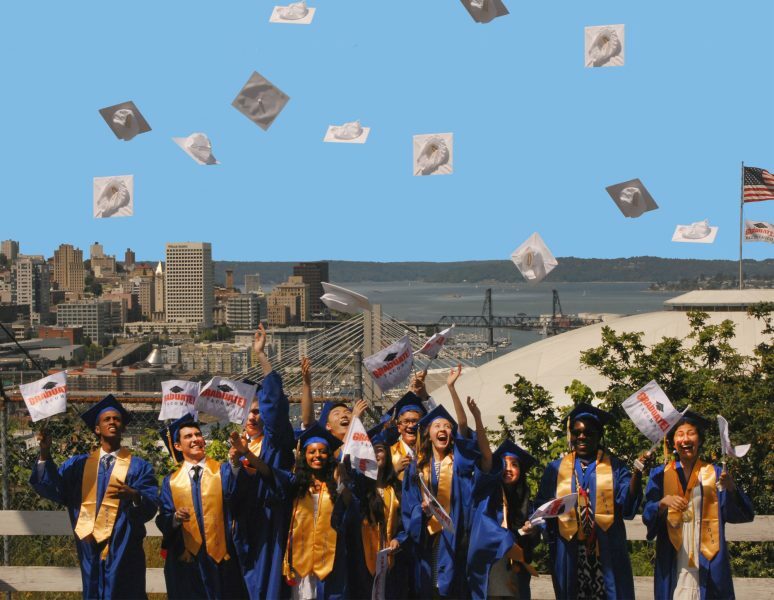 By the class of 2020, Graduate Tacoma is committed to increase by 50 percent the graduation rate of TPS students and those who complete a college degree or technical certificate. StriveTogether congratulates Graduate Tacoma on this milestone along the path to success for every child in Tacoma, cradle to career!